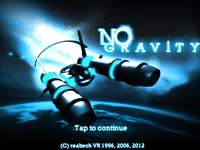 For the PlayStation Portable system, "No Gravity - The Plague Of Mind" is a 3D space shooter which allows you to control a spaceship from the first-person or third-person perspective. Your job is to accomplish missions, with diverse objectives ranging from destroying enemy ships or bases, escorting allied ships, raiding ground bases, clearing mine fields, etc. First person and third person 3D view. 5 different ships with 3 differents paints. 6 different weapons and upgrades. 31 missions (two difficulty levels). 6 different worlds in space, on planets and underground levels plus secret missions. Entitlements rewarding system : Earn game points by the completion of game specific challenges and use them to buy artworks in the game. Available in English, French, German, Dutch, Portuguese and Spanish languages.